Art Radar Asia recently spoke with German-born curator Tobias Berger, who currently holds the position of Chief Curator at the Nam June Paik Art Center, about the Center’s exhibition “The Penguin that goes to the Mountain“. During this interview, Berger also revealed a few of his observations on living and working in the Korean art environment. Korean art has always been in the shadow of Japanese and Chinese artistic success, often “dismissed as a mere conduit between the two mega cultures.” This may be because few of the local magazines, exhibition catalogues and other art texts produced on Korean contemporary art are available in English. As Berger states, “There are none. They’re all in Korean. There’s nothing really good in English.” And while the local art scene is perhaps not on par with what can be experienced in these neighbouring countries, Berger notes that the art that is being produced in Korea is of a very high quality, due to good art schools, a diversity of art spaces, talented pioneers and governmental support. 'Shamoralta Shamoratha' (2007) by Inbai Kim was shown at "Korean Eye: Moon Generation" in 2009. Korean Eye was founded in 2009 as a way to support emerging Korean artists by providing international exhibition opportunities. As a European who formerly lived and worked in the Hong Kong art scene, how do you find the South Korean art scene compares? How do you keep up to date with the Korean art scene? That is a problem because it’s all in Korean and it’s very difficult to keep up [with]. I mean, you just go to the 10-15 [art] spaces once a month … and you talk to your friends and your colleagues that go to the big exhibitions…. You just have to look at how it is. There was a [recent] survey show called “Bright Future” but it only had twelve artists. Tell us about the art school system in Korea? How does it differ from other places? It’s the most sophisticated [system] because it had some good pioneers [and] a lot of governmental help. [South Korea] has some good art schools and it has a lot of good artists that have studied overseas and come back. This allowed a lot of critical discourse and [there were] a lot of magazines. That allowed the art scene to grow well and in the right way. Korean art is becoming popular with international collectors. “Korean Eye“, for example, was shown at The Saatchi Gallery in London earlier this year. Can you tell us why you think this is happening now? An article by The Japan Times covers the opening of a brand new art museum in Japan dedicated to the Korean-born artist Lee Ufan. The article features an extensive interview in which the artist reminisces on his youth in a Japanese-occupied Korea and his early years as an artist in Japan. Lee Ufan's painting 'From Line (1974) is on display at the newly-created Lee Ufan Museum in Japan. For some people, it won’t look like a museum. Some people might think it’s a mosque, or a grave. That’s fine. I wanted it to feel far removed from everyday life. The article also discusses Lee’s unique role in the Japanese art scene. Being both a resident of Japan and an outsider, due to his status as a Korean-born Japanese artist, he has interesting insights into the history of Japan and Korea and the art scene in Japan. These days, when we think of art, we immediately think of it being something that you look at. But it is actually only in the Modern period that this act of looking has been given such emphasis. Before then, there was more to it: myths, religion, social issues. People would know these stories and they would read them into the art. In other words, the act of appreciating art was completed in the mind. After all, Asia has a monsoon climate, so there is a lot of rain. There’s always things rotting and new life sprouting and, in the past, this gave rise to strong tendencies toward animistic beliefs. Asians are more likely to see themselves as living with nature, with the rest of the universe. The museum will hold many of Lee Ufan’s canvases and sculptures, created since he began his artistic career in the 1970s. Work by internationally renowned Korean sculptor, Lee Jae-Hyo, will soon be on show in Hong Kong for the first time. In a new exhibition, “From the Third Hand of the Creator”, to be held at Hong Kong’s Kwai Fung Hin Art Gallery from 31 July until 20 August this year, the gallery will present thirty pieces of representative works from Lee Jae-Hyo, including work from his “Wood” and “Nail” series. Born in Hapchen, South Korea, in 1965, Lee Jae-Hyo graduated from Hong-ik University with a Bachelor degree in Plastic Art. Working with wood, nails, steel and stone as his primary media, Lee focuses his attention on exploring nature’s structural construction. The works are made from a process consisting of dedicated design and complex composing, sculpturing, grinding and refining. The wood pieces are assembled into curves, with which various futurist forms in hyper-modernist style are drawn. Each piece is still embroidered with growth rings. His method has been applauded for exuding a strong personal character and opening up a distinctive direction within contemporary Korean art. Allowing the materials to speak to him, he builds self-contained worlds that mysteriously communicate with their outer surroundings. One of his most striking images is a photograph of a boat-like structure placed in the midst of a stream whose banks are covered with trees. Clearly a manmade sculpture put out into nature, the work contrasts with and succumbs to its surroundings. In the photograph, self-sufficiency is enhanced by the object’s position in a beautiful scene; the poetics of the sculpture lean on an environment that frames its polished surfaces, conferring a further dignity on a form in keeping with its forested setting. Lee’s works are created through the assembly of a large number of units of the ingredient, and therefore become the respective images of the individual units. In their overall structures and forms, minimalist geometric lines can be found, rich in hyper-modernist imagination. Lee’s art is built upon a typical oriental spirit – in the pursuit of unity and a harmonious co-existence between him and the universe, Lee attempts to demonstrate how humanity can continue to develop civilization with grace, on the basis of a mutual respect between the man-made and natural worlds. 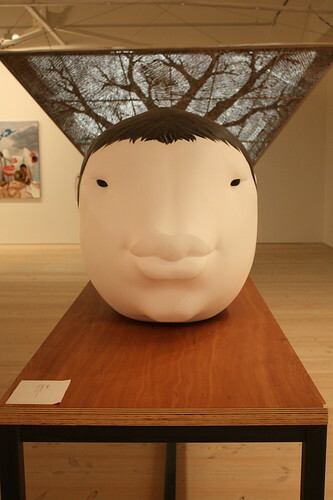 Lee Jae-Hyo has exhibited widely: in Korea, Japan, China, the United Kingdom and the United States. He has won many awards, including the Grand Prize of Osaka Triennial (1998), Young Artist of the Day, presented by the Ministry of Culture of Korea (1998) and the Prize of Excellence in the 2008 Olympic Landscape Sculpture Contest. 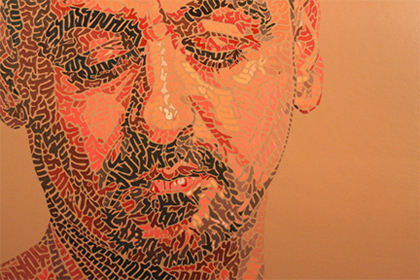 His artwork is collected by a number of prominent Asian, European, American and Pacific museums, hotels and universities. “From the Third Hand of the Creator” will be on show at Hong Kong’s Kwai Fung Hin Art Gallery from 31 July until 20 August this year. Four Asian artists were nominated for Pulse Awards at the PULSE art fair which took place in New York City and Miami between 4-7 March 2010: Shun Duk Kang from Korea, Hiroshige Furuhaka from Japan, Farsad Labbauf from Iran and Sopheap Pich from Cambodia. Though none of these four artists won either the PULSE award or the People’s Choice award, the fair gave them extensive exposure (they each won their own booths) and point to their status as emerging names in the global scene. Shin Duk Kang, a South Korean artist, is represented by Seoul’s Galerie Pici. She creates installation art that reflect the limits of her material while evoking nature in her work. She also makes prints, which utilize geometric forms to continue exploring the subject of nature. 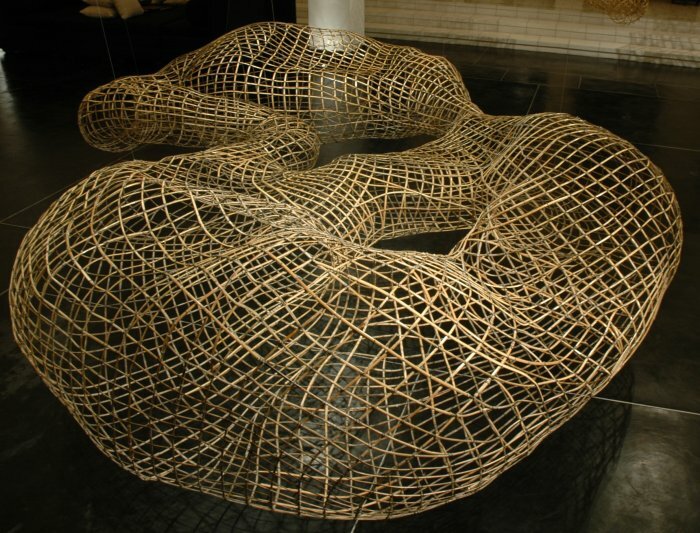 Sopheap Pich is a Cambodian artist represented by Tyler Rollins Fine Art of New York. His work mostly consists of sculptures of bamboo and rattan that evoke both biomorphic figures and his childhood during the Khmer Rogue period. He has become a major figure in the Cambodian contemporary art scene. Subscribe to Art Radar Asia for more news about contemporary Asian artists. Over the past six decades, Korea has witnessed enormous economic and social changes that artists have responded to with a diverse range of approaches, as they grappled with tensions between tradition and modernism, and issues of industrialization and urbanization. Two main ideological movements have emerged, one trying to transcend tradition, and the other trying to rediscover it, yet both have one common quest: finding a strong cultural identity.The exhibition, “Transcendence: Modernity and Beyond in Korean Art,” at the Singapore Art Museum, examines the development of Korean art from the 1950s to the present as seen through the works of 13 artists. The show, which runs until March 15, has three broadly themed sections. The first part looks at the origins of Korean Modernism in the 1950s and focuses on three major artists: Park Seo Bo, Lee Ufan and Kim Tschang Yeul. “They’re generally regarded as key artists that have helped move Korean art into modernity,” Tan said. Between 1957 and 1965, Park was one of the leading forces behind the Korean Informel movement, the first major abstract movement in Korea to challenge the established Japanese-mediated, French Impressionism style (Korea was under Japanese rule between 1910-1940). Informel works often used rough brushwork and mixed media on a large-scale canvas with strong color in an abstract style. Yet, although artists were looking at ways to experiment, they also sought to adapt abstract principles and include some Korean iconography in their works, noted Choi Eun Ju, guest curator for the show and branch director of the National Museum of Contemporary Art, Deoksugung in Seoul. Park was also a key player in another important Korean art movement, Monochromism, which he defined as the synthesis between the traditional Korean spirit and contemporary art. Proponents of this 1970s movement, which included Lee Ufan, emphasized the color white, a color often associated with the “spirit” of the Korean people. “For me, painting has become a mere tool and method to cleanse and purify myself,” the 77-year-old artist said, likening his work to chanting in a temple. Although they have different backgrounds – Park was trained in Korea, Lee in Japan and Kim in Europe and the United States – all three have imbued their works with Korean sensibilities, aesthetics and philosophy, Tan pointed out. Kim, who is best known for the translucent water drops on his paintings, has introduced Chinese characters in his work, an intrinsic part of Korean culture because of the neighboring country’s influence on Korea over the centuries. The second part of the exhibition looks at the generation of artists who emerged in the late 1970s and early 1980s, and who started to incorporate everyday objects into their canvas and to work in a more figurative style. One of them, Kim Kang Yong, has become known as “the brick artist” because of his use of sand on canvases to depict bricks in various permutations. “My work is very much about the industrialization of our society,” Kim said. “I first started using grains of sand and bricks as a reflection on individuality and the role of individuals in nation-building. But today, I’m using the motif more as an aesthetic tool.” Sometimes the bricks are arranged in a grid-like format, conveying the beauty of order; in others, they tumble toward the viewers, conveying turbulence. Several of the other artists shown in this section, such as Lee Yong Deok, Cheong Kwang Ho and Lee Lee Nam, have been stretching the notion of the painting medium. Lee Young Deok, for example, first sculpts a figure then creates a cast of it and uses that mold as his final art work, thus offering the viewer a “negative” of his sculpture. Cheong Kwang Ho uses thin copper wire to create three-dimensional, see-through sculptures that have a certain weightlessness to them as though drawn in the air. Using video, Lee Lee Nam gives viewers of his “moving paintings” an opportunity to reflect on the passing of time and to question what is real. Using traditional Chinese landscapes in digital format, he “transforms” them, slowly changing the landscape – modern skyscrapers appear and disappear amid a traditional mountain landscape, or snow starts to fall. The remainder of the show focuses on Korean art of the 1990s, which has largely been a reaction to the modernism of the ’70s and ’80s, showing a greater concern with the social function of art. “The contemporary generation goes beyond visual aesthetics and pushing the boundaries of the medium; rather, their art reflects their social concerns for the individual, the marginalized, as well as the tensions that exist within society,” Tan said. Kang has described himself as a collector of people’s dreams, translating those onto miniature canvases, providing “windows” into the hopes and dreams of the people he meets. Diverse works by 10 Korean contemporary artists including MOMA acquired artist Jung Yeon Doo are now on display for the exhibition To Have or To Be, organized by the Korea Foundation at Hong Kong Visual Arts until 4 December 2008. Take Hong Soo Yeun for example, whose work features abstract shapes on a red canvas. “To me, image or figure doesn’t mean anything. My piece is called Casting Call because it’s up to the interpretation of the audience,” she said. There are two works by Yee Sook Yung, one featuring four similar paintings of female shamans holding herbs and white vases. A similar theme is explored in Translated Vases, which Yee pieces together pieces of broken vases with gold paint. 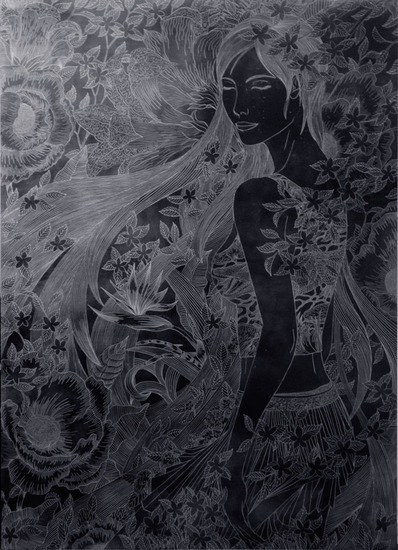 “She wants her work to have a healing function, as everything she draws symbolizes longevity. The sculpture illustrates the possibility of rejects being reborn into beautiful things,” says Choi. Celebrating 10 years of commissioning ambitious and challenging new work by leading international artists, the 5th edition of Liverpool Biennial’s International exhibition MADE UP runs from 20 September to 30 November 2008. Using narratives that hover between fiction and reality, Palestinian Khalil Rabah’s installations, objects, videos, actions and interventions articulate the effects of war on Palestinian society, its economy and identity. His ongoing Palestinian Museum of Natural History and Humankind, for instance, which has had manifestations in Athens, Istanbul, Amsterdam and elsewhere, playfully interrogates history as an accumulation of fact and artifice. This fictionalised museum also questions the notion of archiving and the idea of the museum itself as a repository of objects and construction of collective knowledge. Similarly, in constructing a London office for the United States of Palestine Airlines in 2007, or planting olive trees – uprooted from their original home in Palestine – outside the United Nations in Geneva in 1995, Rabah provocatively plays out ownership of the past and reclamation of a future currently denied. Working across a broad range of media, Kusama is perhaps best known for her compulsive repetition of a recurring vocabulary of forms – polka dots, or phallic tubers, for example – often rendered on bright yellow or red backgrounds. Kinetic sculpture maker U-Ram Choe’s work is a fanciful dialogue of aesthetics and machinery, and explores themes of biological transformation, flight, and movement. Low-tech, but ingeniously inventive, Guy Ben-Ner’s videos often centre on home and family, exploring, exposing and exploiting the relationship he has with his children. Atelier Bow Wow (Japan) and Ai Weiwei (China) are also on show.